WASHINGTON, D.C. — On February 2, MetLife Stadium in East Rutherford, New Jersey, will host Super Bowl XLVIII. During the game, aerial footage will likely show 916 external LED fixtures powered by 1,350 solar photovoltaic (PV) panels with a total generating capacity of 276 kilowatts (kW). MetLife Stadium, home to the New York Jets and New York Giants, opened in 2010, and its PV installation was completed in August 2012. The total capacity of the PV installations is typically dwarfed by the energy needs of powering a football stadium during games and other events, but these onsite energy systems can help reduce the amount of electricity pulled from the local distribution grid. When stadiums are not in use, their PV systems can feed electricity into the local grid. To date, PV installation projects at NFL facilities are concentrated in the northeast region of the United States and on the West Coast. Emerging Power Inc. is launching today its 40-megawatt geothermal power plant, which has a supply agreement involving 20 megawatts of power with Oriental Mindoro Electric Cooperative (Ormeco). The supply deal is hoped to bring down power rates in the province by about 40 percent to P6.58 per kilowatt hour (kWh) from the current level of P11 per kWh upon the project’s completion in 2016. EPI spokesperson Gani D. Capaning said the Montelago Geothermal Power Plant, which is located in Barangays Montelago, Montemayor and Melgar-B in Naujan, Oriental Mindoro, was also being eyed as an additional power source for Occidental Mindoro Electric Cooperative (Omeco). Capaning said Omeco had already accepted EPI’s offer to supply Occidental Mindoro 20 MW of power. He said the EPI project would provide people in the province with a cheap and renewable energy source. “If we keep investing in coal and oil, consumers will be paying P40 per kWh by 2030, if we are to use the estimates of institutions like the International Energy Agency (IEA) and the Economist. In contrast, the Montelago Geothermal Power Plant will stabilize the price over the next 20 years and consumers will only pay a maximum of P7.50 by 2030,” he said. Ormeco president Audel Arago welcomed the geothermal project. “As we anticipate the Montelago Geothermal Power Plant’s commissioning and operation in (2016), we look forward to the positive economic and environmental impact it will bring, when our consumers will have been accorded more affordable electricity drawn from renewable energy,” Arago said. Thomas Lloyd Cleantech Congress: Southeast Asian countries like the Philippines are driving investment in green energy by reducing imported fossil fuel dependency and increasingly adopting renewable sources. “Meet Asia. Meet Renewable Energy’s Future” was the motto at this year’s Thomas Lloyd Cleantech Congress Europe in Frankfurt, Germany. Organized by the investment banking and management group, the event — and co-hosted by the Philippines — the event clearly illustrated the high interest and the high need for increased investments in photovoltaic and other renewable energies in Southeast Asian countries like the Philippines. More than 1,000 institutional investors, financial service providers, asset managers and representatives from government and industry attended the conference, which took place in the Messe Frankfurt exhibition center. Speaking at the event, Philippine Senator Edgardo J. Angara stressed the importance of investment in renewable energy in reducing the island country’s heavy dependence on fossil fuel imports and in their contribution to job creation. He also pointed to the rapidly increasing energy needs of the country and estimated the renewable energy potential of the Philippines to 150-250 GW. Fellow Philippine Senator Senator Loren Legarda added that with the country’s Renewable Energy Act and other regulations such as the feed-in tariff, net metering, a renewable portfolio standard and an exemption for the import of components for renewable energy systems as well as an active fight against corruption, the Philippines had the necessary legal framework for increased investment in photovoltaic and other renewable energies. Now was the time to rigorously implement the measures already started for a climate-friendly energy supply in the Philippines, Legarda added. The installed capacity of renewable energy is to be further developed from the current 5.4 GW to 15.6 GW in 2030, according to current government targets, including 350 MW of photovoltaics. The Thomas Lloyd Group is a leader in investment in solar and other renewable energy sources in the Philippines, said Chairman and CEO T.U. Michael Sieg. In San Carlos, in the Philippine region of Negros Occidental, the investment group funded two solar parks with a total capacity of 22 MW, which are expected be completed by early summer. “A sustainable energy development in the Asia-Pacific region would not only be of crucial importance globally for current and future generations but also a form a basis for further growth in the region,” Sieg added. Addressing the conference via live satellite, former U.S. President Bill Clinton likewise called for increased investment in renewable energy in Southeast Asia and elsewhere. The reduction of dependency on fossil fuel imports, along with favorable political conditions and sharply lowered costs, especially for photovoltaics, is the major driver behind the necessary investment in renewable energy, Clinton stressed. Yet financing remained the biggest challenge in the region’s adoption of clean energy, he added. MANILA, Philippines – Next Generation Power Technology Corp (NGPT), a Filipino-Korean renewable energy developer, is investing P2 billion to develop a renewable energy project in Bataan. The Authority of the Freeport of Bataan (AFAB) said in a statement that it had signed a contract for the project at the Freeport Area of Bataan. NGPT committed P2 billion for a 20-megawatt solar power plant that will be set up in Mariveles, Bataan. The plant will be developed on a 37.5 hectare lot in the freeport area. “We are very pleased to add NGPT to the FAB family,” said AFAB chairman Deogracias Custodio. Nokero International, Ltd. announces their campaign to provide solar light bulbs to those affected by Typhoon Haiyan in the Philippines. Nokero International, Ltd. today announced their campaign to provide solar light bulbs to those affected by Typhoon Haiyan in the Philippines. Nokero aims to distribute thousands of solar-powered lights throughout the Philippines by working with Habitat for Humanity and One Heart for Hope Foundation, official non-profit distributors on the ground. “Our dedicated team has been producing 10,000 solar light bulbs per day now, and we are partnering with wonderful organizations such as Habitat for Humanity and One Heart for Hope Foundation to move some of these units to help those affected by the Typhoon Haiyan,” said founder and CEO Steve Katsaros. The solar lights are being sent to Habitat for Humanity’s Cebu Headquarters and the Philippines Department of Energy, to be distributed to Bantayan and Tacloban where the electric grid is washed out. Lights are produced by Nokero International, Ltd. and funded by private donors and companies including Enfinity, Sasonbi, and Solutions Using Renewable Energy (SURE). The lights provide three to six hours of bright light with each full charge. One Heart for Hope is also distributing lights to the remote islands of Camotes, San Francisco, Pacijan, Tulang, Mararison, Culatis, Busuanga, Camiguin de Babuyanes, Sarangani province, Casiguran and Guiuan, Samar where families cannot afford electricity. Nokero was built on the goal of providing light where none exists, and eliminating kerosene where it is the only option for light. During disaster relief, solar light bulbs reduce the amount of dangerous kerosene lanterns used in temporary shelters and ensure productive construction to continue into the night under bright, portable light bulbs. Small scale solar has made a tremendous impact during disaster relief, particularly in the Philippines where Typhoon Haiyan has affected millions of people. Nokero’s durable and affordable solar light bulbs allow reconstruction and rehabilitation to resume within affected areas. People can rebuild their lives without ending productivity when the sun goes down. The N200 lights being distributed are the most popular product offered by Nokero. They are weatherproof and portable, featuring a high quality solar panel and AA-sized recyclable batteries with an automated sensor to switch off under bright light and conserve energy. Nokero customers can purchase multiple N200 lights at a discounted cost to be sent to the Philippines with Nokero’s NGO partners. Additionally customers can choose to buy brand new N222 solar light/phone chargers, and Nokero will donate an N200 light for every N222 purchased. Visit Nokero’s website for more information: http://www.nokero.com/haiyan. Nokero (short for “No Kerosene”) designs, manufactures and collectively distributes safe, affordable, and environmentally-friendly solar based technologies. Our solar lights and solar battery chargers are high-quality and low-cost, eliminating the need for harmful and polluting fuels around the world. Manila Electric Co. (Meralco) rates for the month of September will go up by P0.18 a kiloWatt-hour (kWh) due mainly to higher power-generation and transmission charges. This follows a cumulative reduction of P0.65 a kWh during the past two months. The average residential customer with 200-kWh monthly consumption will experience an increase of P36 in electricity bills for the month of September. Despite the overall rate increase, Meralco said this month’s generation charge at P5.17 a kWh was still P0.62 lower than the January 2013 level of P5.79 a kWh. The generation charge in January reflected costs in December 2012 prior to the effectivity of the Power Supply Agreements (PSAs), Meralco said. On a year-on-year basis, this month’s generation charge is lower by 23 centavos a kWh than that in September 2012 and reflected the contribution of the new PSAs, which remained to be the lowest-cost source of electricity. WESM prices went up as a result of increases in the trading amount, coupled with higher previous month’s adjustments. Rates of both the new PSAs and Independent Power Producers (IPPs) went down by P0.03 a kWh. This was due mainly to an improvement in capacity factor for some plants and the reduction in coal prices for the supply month of August, which offset the impact of a slight depreciation of the peso against the dollar. In terms of contribution to Meralco’s total supply requirements for the August supply month, PSAs, IPPs, WESM and other sources had shares of 56.1, 41.4, 2.4 and 0.1 percent, respectively. As for other bill components, transmission and other charges increased by P0.08 and P0.01 a kWh, respectively. The increase in transmission charge was mainly due to higher cost of ancillary service charges. Taxes decreased by P0.04 centavos a kWh. Meralco said it did not earn from these pass-through charges, the largest of which is the generation charge. Payment for the generation charge goes to power suppliers such as the IPPs, plants selling to Meralco under the PSAs and the WESM. The rest of the pass-through costs include transmission, taxes, universal charges and other fees. “These are ideas that could sound too good to be true,” admits the project CEO, Joakim Haugue, adding that in the early days the project met with an equal measure of enthusiasm and skepticism. In addition to producing food and desalinated water in regions that indigenously lack both, the facility is also looking into greening the desert and creating alternative, eco-friendly fuel sources. Synergy is one of the cornerstones of the project; it’s what allows it to address so many issues at once, like an elaborate, environmental Rube Goldberg mechanism. The facility features a concentrated solar power plant, which turns heat into steam, then, with turbines and generators, into electricity, which in turn pumps seawater to the site, where it is used to cool the greenhouses. Freshwater waste from the greenhouses is then used to irrigate plants outside. Strategically planted hedges outside the greenhouse help filter the remainder, creating a humidified and cooler environment for plants downwind. Lastly, the saltwater is also used to cultivate algae, which can be used for large-scale bio-energy production — though currently the algae plant is still in the research phase. Algae production on its own, says Corless, can be expensive and dependent on geographical constraints (it usually needs to be developed along expensive, sought-after coastal property). 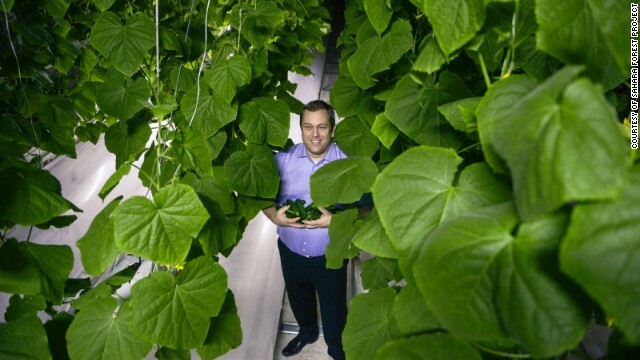 “What we’re doing is putting an algae cultivation system into an even broader system that can share costs and increase energy. One of the biggest shared costs we have is the saltwater infrastructure,” she says. Neil Crumpton, the chair and CEO of Planet Hydrogen, an NGO that promotes green energy, says the project is, potentially, a “game changer”. Some experts, however, question if the Sahara Forest Project is the best use of resources. The facility, which was funded by fertilizer companies Yara International and Qafco and cost $5.3 million to set up. “With the same funding, you could restore ecosystems and help people more effectively through community-based natural resource management,” says Patrick Gonzalez, a forest ecologist who has conducted research in the Sahel region of North Africa with the University of California, Berkeley. “Rather than pouring water on desert sands that haven’t had much vegetation in centuries, you can restore land that until recently had a healthy tree cover. Natural regeneration of trees in the Sahel is less flashy and more difficult, but you could directly benefit the families that depend on the trees,” he adds. Despite the mixed reviews, Hague says that the site has proven itself with the new crop influx, adding that many skeptics have been won over. MANILA, Philippines – There is a silver lining to the heatwave this summer. It is the potential of solar power to reduce our reliance on fossil fuels, according to solar power advocates. The Philippine Solar Power Alliance (PSPA) and the World Wide Fund for Nature Philippines (WWF) celebrated the first ever Solar Day Pilipinas 2013 on Friday, April 26. PSPA president Dante Briones described solar power as a cutting-edge technology and a tool for improving national competitiveness, especially in a tropical country like the Philippines. “The country is actually one of the leading countries in Asia when it comes to solar energy,” Briones said. Solar power, a renewable source of energy, is estimated to produce 20-30% less emissions of harmful gases than coal power. “Why do we have to thoroughly dig the soil just to look for coal when we all we need is to raise our heads to see the sun?” asked Claire Marie Yvonne Lee, PSPA Vice President. Many businesses and institutions have started using solar panels, said Lee. Some of these are Starbucks, the Asian Development Bank, the Makati Medical Center and the Department of Trade and Industry. On the retail side, several non-profit organizations and private companies have been distributing small-scale solar panels, mainly for lighting and communications purposes. On a commercial scale, however, solar panels remain a costly investment for Filipino businesses. PSPA and WWF admit solar power is pricey. In fact, the cost of acquiring one may exceed the initial savings generated from not connecting to the grid. But they believe that, as costs go down, solar panels will become economically efficient over time. Solar technology is usually covered by a 25-year warranty. “A solar system is a good investment,” said Lee. “Unlike a car or a cellphone, it’s not a dead investment,” she added. Lee added a number of banks are also planning to offer loans for Filipinos who want to buy solar panel systems. According to the National Statistics Office, five out of ten poor families in rural areas do not have electricity. In Mindanao, an estimated 70% of poor families are not connected to any power. Showcased during Solar Day Pilipinas were products of various solar power developers. The products ranged from solar phone chargers to large-scale solar systems for bigger homes and establishments. Ten solar power developers namely: Renewables Made in Germany, MERALCO, Tritec, Transnational Uyeno Solar Corporation, GNB Exide, Maschinen and Technik Inc., Cagayan Electric Power, Sasonbisolar Inc., One Renewable Energy Enterprise Inc., Solutions Using Renewable Energy Inc., CEnAG, SunPower Inc., and Propmech joined the event. Solar Day Pilipinas will be a yearly event from now on, said PSPA Founder and Chair Teresa Cruz-Capellan. The use of solar power was originally developed in the Philippines during the 1980s as a response to the lack of electricity in far-flung areas. 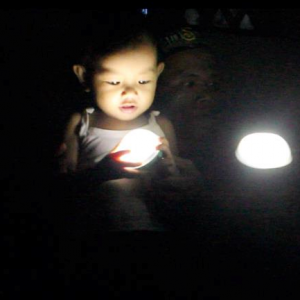 Many lives of Filipinos were changed when solar-powered lights were brought to their communities, Lee told Rappler. “There are really places that that the grid can’t reach. And that’s what solar power is also for.” Lee said. The workshop on energy storage technologies and applications which was held on 3-4 April 2013 was attended by more than 100 participants from the government, private organizations, NGOs, academies, and battery industries. The workshop was able to discuss various topics which include but not limited to latest evolution on energy storage technologies, energy storage for off-grid, island systems and telecoms, case studies, smart grid and energy storage technologies, electricity vehicles, and battery recycling among others. For copy of the presentation please refer to the guidelines below. MANILA, Philippines – Staying true to its “going green” efforts that involve finding alternative and earth-friendly sources of energy, premier health institution Makati Medical Center has installed a Solar PV (Photovoltaic) Generator System that can knock off an estimated 30,000 kgs. of annual carbon monoxide emission — the equivalent of 933 planted trees, or 217 smoke-belching vehicles removed from the streets. The installation, composed of 151 monocrystalline modules with a 25-year lifespan, is located on the rooftop of the 10th floor of Tower 1. It is the first installation in the country to use Solar DC Optimizers, which enhances the throughput of the systems even with shadows.